The first individual panel frameless opening glass wall system that provides visual privacy on demand. 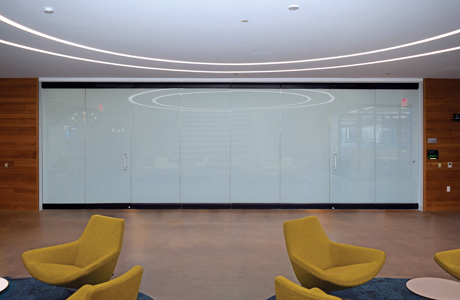 Using the best dynamic glass available, this all glass system offers instantaneous opaque privacy or transparent connectivity at the touch of a button. Privacy on demand without any vertical interruption, that’s the beauty of all glass. WhiteOUT is wireless and operates easily with a remote control. Operation of incorporated swing panels causes no interference to the glass activation. No additional need for costly drapery or shades required, maintaining a clean aesthetic with the best dynamic glass available. Individual sliding glass WhiteOUT panels are able to stack remotely and out of sight when not in use. Free up valuable space and stack panels in a closet or hidden parking bay. 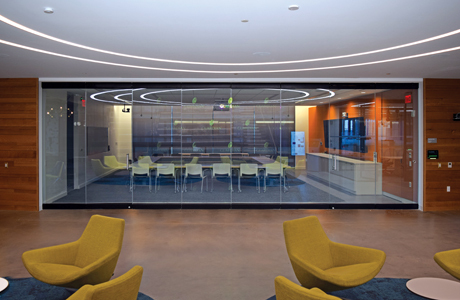 When called for, this unique product allows the all glass panels to be used as a projection screen or whiteboard truly making the NanaWall opening glass wall multifunctional. WhiteOUT was unveiled at the AIA Show in 2018. We will continue to add more information, professional photography, technical files and design files. Please complete the form below to stay up to date with the NanaWall WhiteOUT.